JSC “Concern “Granit-Electron” is one of the major forefront Russian original equipment manufacturer of radio electronic warfare systems for Russian Navy. JSC “Concern “Granit-Electron” in participation of integrated enterprises provides R&D, manufacturing, test and trials, delivery and service support for supplied radio electronic warfare systems. 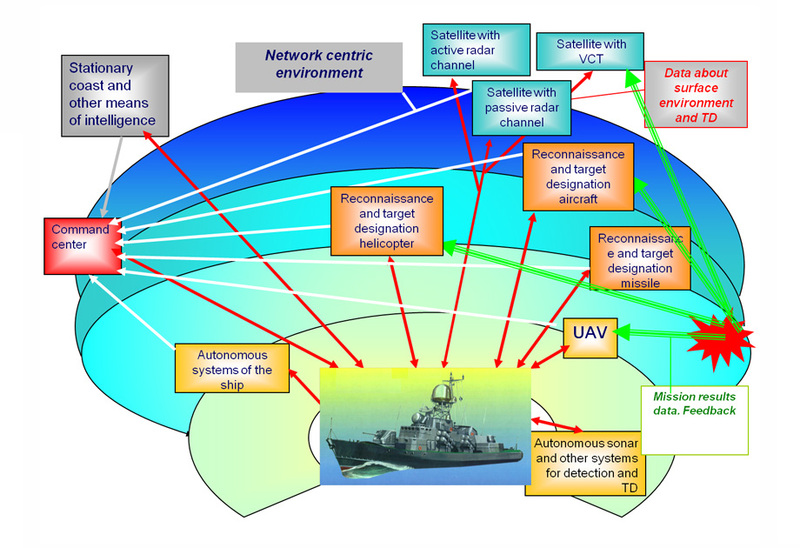 Joint forces surveillance, target designation & attack radar systems for surface ships, submarines and coastal carriers equipped with missile weapons. Avionics, guidance and command systems for high precision missiles and antisubmarine weapons. JSC “Concern “Granit-Electron” has a huge experience in the field of interfacing and integration of warfare command systems between ships, coastal, airborne and space carriers that would enable task force groups to form network centric environment for naval operations. 7. Mapping support for target localization zone in view of weather conditions and another dynamic data. All these carriers to be integrated with ground-based or ships control systems vide common data links to provide real time designation and attack data for missile weapons in network centric environment. To obtain this purpose our systems have data exchange channel. JSC “Concern “Granit-Electron” developed multipurpose radar system type equipped with autonomous surveillance and target designation functions (by active and passive radar channels), channels for receiving data from airborne posts and spacecrafts, data channel for control mutual orientation and data correlation between carriers. Surface surveillance system with data channel for communication with airborne posts and spacecrafts are incorporated into submarines. 1 – Node for target designation required for generation combat mission. 2 – Node for weapon control system for generation flight trajectory for missiles on the base of data received from stationary posts, aircrafts, satellites). 3 – In perspective, third node can be used for feedback regarding hit or not hit targets and damages. Satellites, manned and unmanned aviation mainly with optic channels are used for receiving feedback data. This data required for taking a decision by the ship to continue or cancel the attack. All these functions were realized Syria. Availability of the above maintained loops ensures the efficient, comprehensive, reliable target designation and attack with missile weapon. Unification of data links up to the joint forces level would enable the existing and advanced perspective missiles carriers of Russian Navy Forces to perform attack missions with high accuracy and efficiency at any operation zones. JSC “Concern “Granit-Electron” established electronic firing test site for enhancing missile and torpedo control systems under active ECM and EW activities of potential enemy at any theatre of operations. Electronic firing test site simulates missions by application of fundamental mathematical and function wrapping tools with mini-max algorithms required for efficient weapon employment with maximizing damages and minimizing losses.